Our cafe is open during our public opening days on Wednesdays and Fridays! 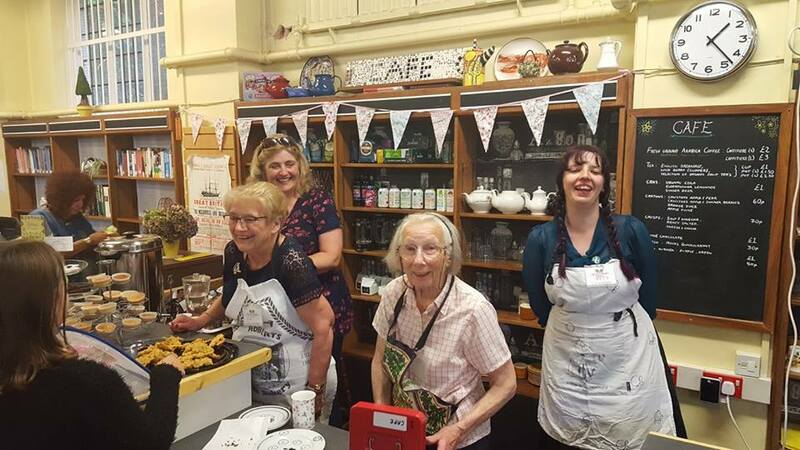 Our community cafe is open for tea, coffee, cakes and snacks throughout the week and is available for everyone to come and enjoy the beautiful space we have created! Get yourself a cuppa and a cake, relax on our cosy sofa, pick up a book or play a game and enjoy The Old Library! Our cakes change weekly, and we have a wonderful selection of cakes, crumbles, flapjacks and brownies, along with some specials, so we can ensure you will find something on our counter that is to die for! New for Autumn, we have our delicious Bramble & Pear crumble, two of Autumns favourite flavour’s combined in a crumbly, almondy dream of a slice! Or how about our Yoghurt & Berry Flapjack, a delicious balance of balsamic infused berries layered between moist buttery oats & topped with creamy yoghurt?! The favourite this month seems to be our Blueberry Bakewell – a grated marzipan and rich buttery almond frangipane, scattered with fresh blueberries. Baked till just browning and sugar dusted to perfection! Also on the cake table this month is our Ultimate Chocolate Brownie, made with beautiful belgian chocolate chunks, and the magnificent Jewel Bar, a hazelnut base smothered in sticky caramel and jam packed with cranberries, pumpkin seeds and belgian chocolate… if you’ve got a sweet side! The Old Library is 100% volunteer run, by local residents to ensure we as a community have a place we can love, share and meet. We are currently open on 2 days a week, but are looking for local people who may like to volunteer for a few hours to help open the doors at the weekend too. We are also interested in those who might like to bake or make savoury foods once we have our new kitchen (it’s on the way!). If you’d like to be involved in the cafe, want to bake for us, or have some ideas for cookery classes or workshops (or anything else for that matter) then please get in touch! !